The Funeral Service for Boge Markoski of Ballajura will be held at St Nikola Macedonian Orthodox Church, 69 Angove St, NORTH PERTH on THURSDAY (04.04.2019) commencing at 10.30am. Following the Service the cortege will proceed to KARRAKATTA Cemetery for a Burial Service commencing at 12.15pm. 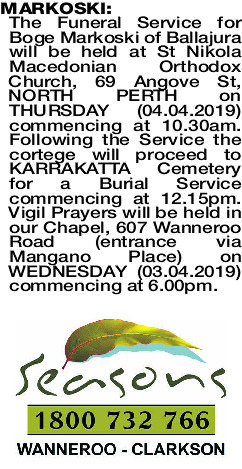 Vigil Prayers will be held in our Chapel, 607 Wanneroo Road (entrance via Mangano Place) on WEDNESDAY (03.04.2019) commencing at 6.00pm.